A Parador for those who consider a twenty eight kilometre slow mountain road with many bends justifies a stay in wild exceptional mountain scenery. The hotel is in the middle of the Cazorla National Park and is surrounded by forests in which deer, wild boar and ibex have their homes. The windows of this Parador give panoramic views of this countryside and the atmosphere of tranquillity and beauty is heightened by the scent of the surrounding pine trees. The views are particularly dramatic at the approach to winter when the leaves turn to orange and gold. The building follows in the tradition of the typical Andalusia mountain lodge. The interior is simple and unpretentious with its pleasant sitting room with comfortable furniture and large windows. 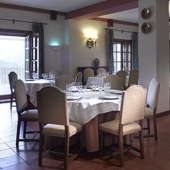 The rustic restaurant at the Parador specialises in game which appears on the menu regularly during the hunting season. The restaurant also has a gluten free menu. "pipirrana" which is an Andalusian mixed salad. The town of Cazorla is dramatic with the well kept houses rising up protected by the castle. The castle is worth visiting and also the churches of Carmen and Santa Maria. Your visit should also include the monasteries of San Juan de la Penitencia and Montesion. Further afield go to the Templar castle of Iruela and the Roman villa of Quesada. Also go to Ubeda for its examples of Andalusian Renaissance architecture. The main local festival takes place in Cazorla on September 17th. Other festivals are at Iruela on August 28th and the local Feasts of San Isidro (May 15th) and San Blas (first Sunday of February). The National Park of Cazorla, Segura and Las Villas gives the opportunity for hunting, fishing, walking, riding horses, cross country driving or mountain biking. In late September from the terrace of the Parador of Cazorla you may be able to watch the battles of stags while battling for supremacy within their territories. The unheated swimming pool has impressive views over the Nature Reserve. The Cazorla Parador has twenty six twin bedded rooms, six rooms with a double bed and one suite. All the rooms have a private bathroom. The rooms also have a telephone, satellite television, safe and a minibar. Parador Cazorla has central heating, parking facilities (without security and limited places), piped music, currency exchange, lift, satellite television, garden, seasonal swimming pool and a children play area, a restaurant and a bar. Air conditioning is not thought necessary due to the fresh mountain air. Distance from the nearest airport is approximately 230 kms and the nearest train station is 90 kms away. Very enjoyable 2 day stay. Whilst at this hotel we much enjoyed the cuisine as we had a Half Board booking. Reception was excellent and helped us to our room with baggage. The bedroom was very roomy and we enjoyed using the settee and other furniture. we used the WIFI and found the speed adequate. The view from our room was over the valley, gardens and swimming pool which we then explored. The restaurant was of a high standard as was the Buffet Breakfast - cooked if you wished. The location of the hotel is in a beauty spot and quite a way from the town of Cazorla. This was not a problem as we wanted to explore the Sierra de Cazorla. After much enquiry, debate and without a 4X4 vehicle we finally made it to the Nacimiento(Source) of the Rio Guadalquivir which was a major object of our visit. Due to the recent upgrade to the untarmacked Camino Forestal from there to Pozo Alcon we departed from the hotel that way and with no problems. A wonderful time at the beginning of our holiday in Spain. We stayed in the Parador Cazorla for 5 nights in early April 2015 for our 20th wedding anniversary. This really is a secluded paradise in a beautiful location, and quite some distance from "civilisation" (precisely what we wanted, but visitors should be aware that the nearest town is a good 20 minute drive away). The staff were very helpful and courteous, and the restaurant was truly excellent (we had a different dish every night, and were never disappointed). Picnic supplies could be provided on request for lunch whilst out walking, and these were exceptional too and very good value. The little museum on site is well worth a look. The only downsides were that it could sometimes be noisy in the Parador due to the lack of soft furnishings and the wooden floors, with sound travelling a long way down the corridors from the reception. The grounds looked a little unkempt (presumably because it was the beginning of the season), but we did see wild boar and deer up close while walking around the hotel on our first evening! For wildlife lovers, the national park is one of the most pristine locations in Western Europe. May 13 - 14 - 15 - 2015 After a warm welcome a nice room with a nice view was our stay for 3 nights. A very helpful receptionist enabled us to vistit the Alhambra in Granada on Monday May 18. Every day the dinners tastes were a pleasant experience with a friendly service. Among the Paradores we visited throughout Spain this one is special in getting there across the nature for 45 minutes and 132 curves from Cazorla city. Our experience is told to other travelers who like Spain. 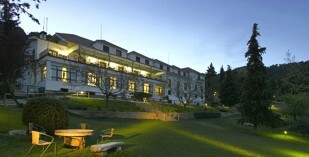 Luxury Andalusia country house hotel, the Parador of Cazorla is in a National Park.